Facebook continues to expand its push into video, this time by enabling even more publishers to insert ads into their long-form video content. I say 'may' because video publishers still have to meet Facebook's eligibility criteria for ad breaks - in order to qualify, Pages need to have at least 10,000 followers and have facilitated at least 30,000 one-minute views on videos that are at least three minutes long within the last two months. The math is kind of annoying (well, for me it was) - helpfully Facebook has also provided an easy way to see if your Page meets these requirements. Click on this link and Facebook will provide a simple listing for your Page/s, detailing each element and whether you meet the bar. 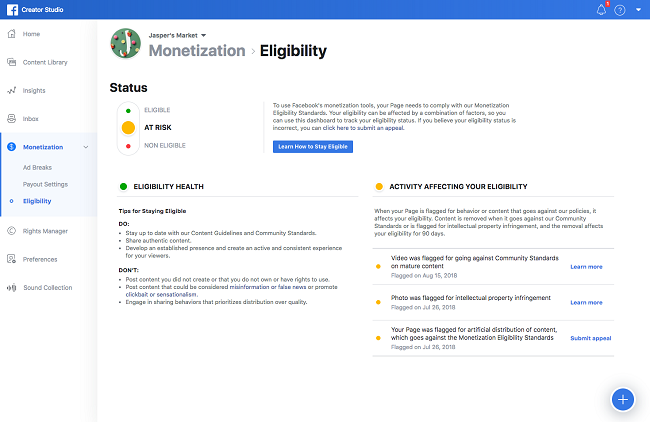 You can also check your ongoing eligibility in Creator Studio, where you'll be able to get a full listing of potential issues to keep an eye on. 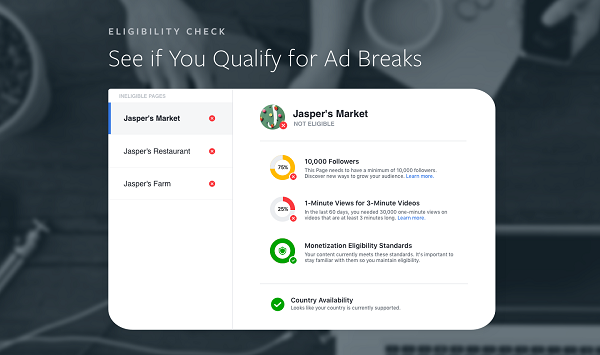 Facebook originally made video ad breaks available in the US, UK, Ireland, Australia and New Zealand, but with the expansion of Facebook Watch to all users globally, and added capacity for publishers to generate more video views through the platform, Facebook's also keen to provide more ways for publishers to make money out of their efforts, in order to entice them to keep posting. Mid-roll video ad breaks are notoriously annoying. Various studies have shown consumers don't like the interruptive format, so much so that Facebook, at one stage, was reportedly considering getting rid of them entirely. But then Facebook softened its stance - earlier this year, The Social Network published a report which suggested that users don't mind pre and mid-roll video ads, so long as they're not too long. That makes sense - Facebook can make a lot more money by expanding its video ad options, but still, video ads are annoying. But are they more annoying than traditional TV ads? That's the angle Facebook's playing here - the traditional TV ad market is worth an estimated $70 billion in the US alone, and they're able to generate so much revenue from TV because we're accustomed to sitting through the ad breaks, where the networks can pump out streams of expensive ad slots all at once. Digital ad spend now outpaces TV, and will continue to do so - but for online platforms which are looking to replace TV-like exposure for brands, and take a chunk out of that revenue pie, they need to also maintain ways to expose users to ad content. Essentially, what's Facebook's saying is that while removing mid-roll would provide a better user experience, even with them, it's still better than traditional TV. They make money, you get the video - we're all good. Right? 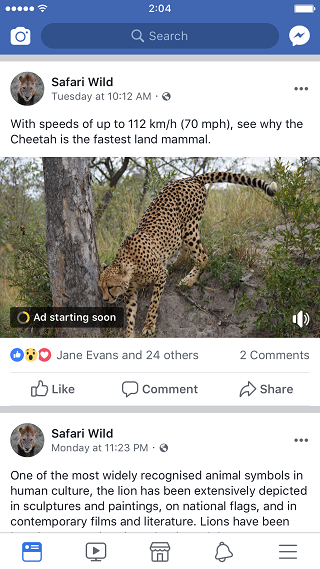 It remains to be seen whether users will accept mid-roll ads on Facebook video, or how effective they'll be for brands - though Facebook does note that they are "seeing strong interest in Ad Breaks and early signs of program success". But regardless of viewer sentiment, its hard to argue the potential effectiveness of video ads, and with Facebook looking to push Watch viewership, it could be a great option. I hate mid-roll video ads, you do too, but good ones can work. And it is better than sitting through gaps of eight commercials in a row.